Sabbath Walk: Bye 2012! Hello 2013! TITLE: BYE 2012! HELLO 2013! "Paul, an apostle of Christ Jesus by the will of God, To the saints in Ephesus, the faithful in Christ Jesus: Grace and peace to you from God our Father and the Lord Jesus Christ. A year ago, we were wishing one another a "Happy New Year." Yet, after 12 months, I hear people saying, "Thank God it's over," or "Good riddance, 2012." What happened? The cycle repeats itself every 365 days. We begin with a hopeful new January but it is common to see people heave a sigh of relief at the end of December. Why? Of course, not everyone is that pessimistic. Not everything needs to be so negative. Yet, December did not really end well. Open up the newspaper, and when you see shootings, wars, fights, and all kinds of tragedies, one might be forgiven for thinking negatively about the year 2012. After all, according to the Mayan calendar, 2012 was supposed to usher in the End of the World. More specifically, it was supposed to be December 21st, 2012 where the doomsday scenario would all play out. Earthquakes, tidal waves, storms, tsunamis, and so on. Last Sunday, I preached on the need for us to reflect on the year ahead, to look back with gratitude, to learn with humility, and then to properly leave the year behind. No point bringing excessive baggage from 2012 to the new year. Lest 2013 starts to resemble an extended and dreaded 2012. Before we can say goodbye, we must take time to reflect, to take a hard look at the events past, and to learn humbly from the lessons. Last year, I completed my studies at Gordon-Conwell. After four years of flying back and forth from the West to the East Coast, I received my degree and along with it, much congratulations from friends and loved ones. The road has not been easy. Working and studying, plus my pile of books to be reviewed can be quite a tall order. At the end of it all, the feeling of completing the race is satisfying. All the hard work, the time put in, and the crazy time of writing and editing reminds me again that I am getting old. Gone are the days where I can do multiple things at one time. Gone are the days where I can connect easily with so many different people with greater hours of wakefulness. Not anymore. I find myself moving slower and getting more forgetful. I find myself pausing more often because life does not comprise of an abundance of non-stop activities. I find myself becoming more discerning of what things are necessary and what are not. A crazy busy life no longer excites me. I prefer something more quiet, more peaceful, and more contemplative. That is why I write more. I write more so as to put down my hopes and desires for my family to remember, that because God has first blessed me, I will bless others with the gifts that I have. This is what the Apostle Paul teaches. In a stark reversal of the way the doxology is normally used, Paul begins his epistle to the Ephesians with a doxology. He begins with the blessings of Christ, that we do not need to look toward the future thinking that only then we get to be blessed. Paul reminds us again that we have already been blessed. Not only that, we have been blessed with 'every spiritual blessing in Christ' in the heavenly realm. In other words, we are called to begin from the position of blessedness. Paul begins with an assured identity in Christ. Right at the beginning of the letter, he proclaims unabashedly his calling in Christ to be an apostle. An apostle is a servant of God, a follower, a specially chosen disciple of Christ. Sometimes, we distinguish the word 'apostle' as referring to the first disciples of Jesus, as those who have seen in person, our Lord Jesus. In that way, Paul is an apostle, as he has met Jesus in his encounter at Damascus. The same goes for the first disciples who walked with Jesus. In a way, we are all apostles, as in some special way, those of us who have confessed Jesus as Lord and Saviour, will have had a personal experience with God. We are then able to begin in blessedness. We are blessed to be blessed. This beginning is important for three reasons. Firstly, it is an assurance of God's presence. Being blessed is a sign of being marked for spiritual gifts, to be ready to receive even more. It is a passport to that life in Christ. It is that mark of identity that in ourselves, we can do nothing. In Christ, we can do anything. It is because Paul knows God is with him, that he is able to greet the people in Ephesus, "Grace and peace to you from God and Father of our Lord Jesus Christ." Recently, I shared a story about a man being yelled at his workplace. Fearing for his job, he refrained and retreated into silence. Upon his return home, he started to yell at his wife for the most mundane things. His wife, trying to be an understanding homemaker, released her frustration at her teenage son. The son ran out of the house and kicked the cat. The cat rushed back to the house and scratched the man. The man called in sick and forced his supervisor to put in an extra hour to cover the man's work. When we are assured of God's presence, we will not be given to yelling so easily at the slightest provocation. Instead, we will cover our tracks and our actions with prayer, trusting that God will teach and guide us in the way that we should go. Secondly, it is an assurance of our calling. Being blessed is a way that God affirms us in our calling. In our dizzy race toward finding out what our calling is, we often forget that our calling is made more sure not in passive yoga-like posture, but in active faithful service. We are called to serve, not to be served. We are called to help, and not be constantly on the receiving end of help. We are called to share and to care, and not to expect others to do the heavy lifting for us, especially when we have the hands and the legs to do the sharing and the caring. Calling is a much touted word for us. The trouble is, I think we have given the word too much attention, and forget that we are already called to be faithful where we are. We are too future-sighted for our own good. In planning so much for the future, we forget to properly live out the present. Someone recently said to me that all of our lives, we are constantly planning for the future. It all looks very logical, and very practical. After all, if we do not plan for the future, we are not being responsible. However, have we paused to smell the flowers of life? In our rush to get things planned for the future, have we forgotten to live, and to love? The present is not meant solely to be the fuel for the future. It is after all, the future that we have been talking about yesterday. It has been said before. "The past is history. The future is mystery. That is why the present is a gift." Appreciate our calling in the present to be the best that we can be. Do not be deceived that only the future is the best. For all we know, we are to be the best self, yesterday, today, and tomorrow. There is no such thing that only tomorrow will be better. If we have been blessed in Christ, every day is going to be better. Thirdly, it is an assurance of God's will for us. We have often talked about what is God's will for our lives, and then we get stuck at the words, and conveniently procrastinate about the good works.We have all been trained in this. What is your next job going to be? There is a strange project for nearly every Christian I meet. What is God's will for me? There is a three-word default answer: "I Don't Know." 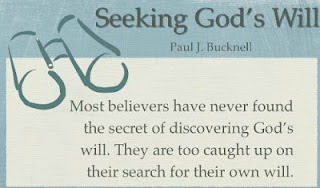 Sometimes, what we need is a rebuke, just like Paul J. Bucknell, who warns us, "Most believers have never found the secret of discovering God's will. They are too caught up on their search for their own will." 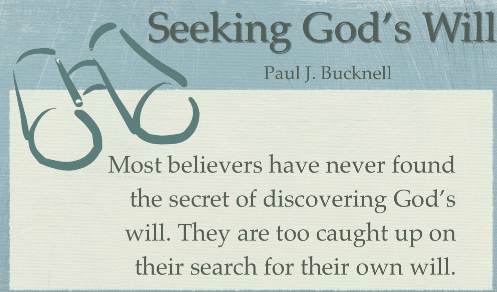 Maybe, that is why many of us get stuck into trying to discover God's will for us. We are simply discontent until we get our own favourite versions of God's will going our way. We are too caught up with ourselves that God's will become more and more distant from us. Rather than chasing after a version of God's will for us that has to fit into our own convenient schedules, our own complacent liking, and our own preconceived notion of spiritual planning, we must seek out the heart of God. The heart of God is not just aimed at us. It is for the whole world to be saved. How are we playing our role to do just that? So let us enter the year with these three assurances of faith. That we are assured of God's presence. That we are called to be the sons and daughters of God. That we are to work out God's will for us, by sharing the good news, by blessing others because we have been greatly blessed. Perhaps, the reason why the 'happy' in any new year greeting has been so elusive is because of our inward looking disposition. God has not given us a faith so that we can lock it up in our security chests of spirituality. Neither has He given us blessings that we will only keep for our self-consumption. He has given us more. He has given us His Son, Jesus for us to receive, and to give of ourselves, the way Christ has given us. The gift of salvation is free to us. We are thus set free to freely give of ourselves to others, in sharing the gospel, in serving our community, and in saving the best we have for the rest of God's concerns. THOUGHT: Substitute your impersonal "Happy New Year" with a personal Holy New Life.